As a swimming pool builder, I was pleased to be invited to contribute to this important forum on pool safety. Nobody wants to live with knowing they contributed to ending the life of another person, let alone a child – surely the worst thing to live with. We all have enough stress in our normal lives without carrying around such a burden. It is no doubt a life changing experience. The closest I have come to feeling that shock and fear was during the installation of two of our pools at client’s houses. It has happened twice in the 20 years I have been in the industry. Thankfully no lives were lost but it was close both times. Both kids, toddlers, were in a coma for 24 to 48 hours. The anguish of the parents and family is something you wouldn’t want to see. At that stage, the worry of brain damage is the major concern. Luckily both kids made full recoveries, but I often think about those times and how I felt. It goes to show that owning a swimming pool is a lifestyle change in more ways than just fun and games. People who have not owned swimming pools before do not realise that they are then also responsible for the lives of others. Toddlers once roamed relatively freely around a house without a pool, but it should not be allowed to happen when there is a pool around – pool fence or not. As a pool builder we want to sell the pool. That’s our area of expertise. We are not really interested in any extras that will stick a spanner in the works for us. We pool builders only talk about pool safety when we are asked by the client, which is often with young families. It is not something that we bring to the client’s attention as part of our standard sales pitch or at the point of sale, from what I have seen in the market place. Lastly a net or cover is seen to be hard work to put on and off. No one is thinking that they would rather take a risk and have someone drown by not having a net, cover or fence, but the seriousness of safety during the sales pitch is overpowered by the excitement of getting a pool built – the pool builder/salesman is going with the flow, his priority is the sale. 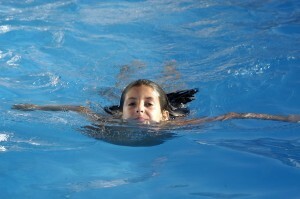 Pool building companies do not make a big deal about safety at point of sale. How many include pool safety in their brochure or on their website? When clients ask us about safety nets,covers or fences we refer them directly to the suppliers. We dread it when a client wants us to oversee that installation as it means the net or cover can only go on five days after the paving is finished. That means we get paid a week later, when we want to get paid ASAP. So, my message is that pool builders could contribute more to pool safety among first-time pool owners and quite easily too at the point of sale. I think pool builders traditionally view the pool industry in separate segments with no crossover i.e. pool building, pool maintenance, pool shops, suppliers and pool safety. Pool builders don’t recognise they have a very important part to play in the pool safety cycle. Yes. There is definitely room for improvement for swimming pool safety among the pool builders. The Consumer Protection Act might force pool builders to be more aware of pool safety, but let’s step up and take the initiative ourselves. And let’s lessen the amount of tradegies occuring in the pools we build. Thank you for another wonderful post. Where else could anyone get that kind of info in such a perfect way of writing? I’ve a presentation next week, and I am on the look for such info. Leave a Reply to Francesco Prentis Click here to cancel reply.